"I am a vegetarian and love to eat these before I go to the gym. I like to add extra whole peanuts sometimes. Substitute 1/4 cup dark chocolate chips for the raisins if desired. If you want to eat them on the go, wrap them in wax paper and tie with a bread tie. Enjoy!" 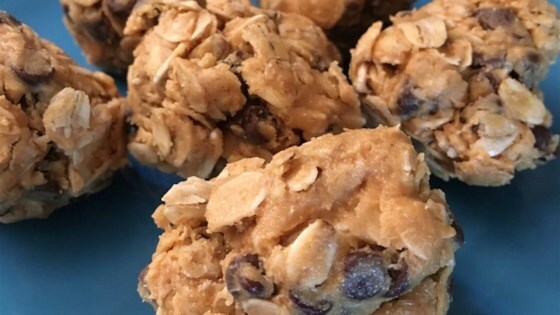 Simple no bake recipe! This would be easy to change by adding chia seeds, carob powder or any other "energy" ingredients! Added a sprinkle of cinnamon. Yum!